Oppo Find X does not come with a fingerprint scanner. Rather it features facial recognition for unlocking the phone. For face unlock, the pop-up camera comes out, recognise the user, unlock the phone, then slide back in. 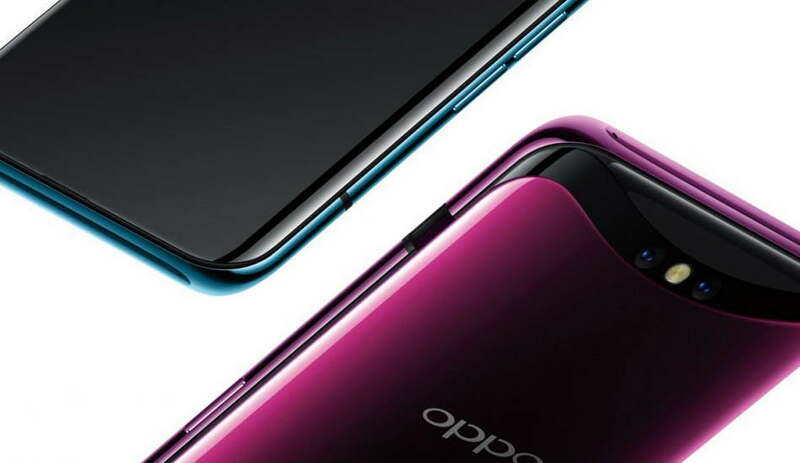 Oppo has today launched its new bezel-less flagship smartphone - Oppo Find X at an event in New Delhi. The Oppo Find X is priced at Rs 59,990 and it will be available exclusively online on Flipkart and the pre-orders will be starting July 25. The delivery of the smartphone in offline stores will start from August 3. Users who pre-order for the smartphone will get Rs 3000 gift voucher. The smartphone comes in Bordeaux Red and Glacier Blue colur variants. At the launch event, company has also announced that the Oppo Find X Lamborghini Limited Edition will also soon debut in India. The Lamborghini Limited Edition was announced earlier with a whopping 512GB of storage. Oppo Find X Lamborghini Limited Edition is priced at 1699 Euros which is approx. Rs 1,34,400. It comes with the Super VOOC Charge technology that was announced at the MWC event in 2016. The phone features carbon fiber texture on the rear with the 3D Lamborghini car logo on it. The Super VOOC charging technology can fully charge the phone from zero to a hundred percent in only 35 minutes. The Lamborghini edition has a 50W charger that can charge the phone’s 3,400 mAh battery from 0 to 100 percent in just 35 minutes. The Lamborghini Special Edition comes with the same set of specifications as of Oppo Find X excluding the internal storage. Oppo Find X has 256GB of storage as compared to 512GB in the Lamborghini edition. Oppo Find X was earlier launched in Paris last month. It features a whopping 93.8 percent screen-to-body ratio which is slightly higher than the one on the recently announced Vivo NEX which comes with a screen-to-body ratio of 91.24-percent. Oppo has opted for the pop-up camera mechanism which we first saw with the Vivo Apex concept at MWC 2018 in Barcelona and followed by the Vivo NEX. The mechanism is motorized and can pop up in half a second to open the camera. As per Oppo, the sliding mechanism was tested to 300,000 slides the average person unlocks their phone 100-150 times a day. Oppo Find X does not come with a fingerprint scanner. Rather it features facial recognition for unlocking the phone. For face unlock, the pop-up camera comes out, recognise the user, unlock the phone, then slide back in. Oppo says this is 20 times more secure than using a fingerprint sensor for a device unlock. Oppo Find X comes with a 6.42-inches AMOLED Full HD+ display with 2340 x 1080 resolution and aspect ratio of 19.5:9. It is powered by 2.5GHz Octa-Core Qualcomm Snapdragon 845 processor with Adreno 630 GPU coupled with 8GB RAM and 256GB internal storage. The Oppo Find X runs Color OS 5.1 on top of Android 8.1 Oreo, however, the company has announced at its earlier launch event that support for Android P beta will be coming soon. The smartphone features a 3,730 mAh battery with VOOC flash charge fast charging promising 2 hours of talk time with 5 minutes of charge. For the camera department, the device sports a dual rear camera setup with 16-megapixel primary sensor with LED flash, f/2.0 aperture, Optical Image Stabilization, Phase Detection Autofocus, Dual-Tone LED flash and 20-megapixel secondary sensor with f/2.2 aperture. For the front, it features a 25-megapixel front camera with f/2.0 aperture for selfies and video calling. The front camera comes with A.I. capabilities to automatically add beautification effects to your selfies. There is also support for 3D emojis similar to iPhone X ones. Oppo Find X measures 156.7 x 74.3 x 9.4mm and weighs around 186 grams. The connectivity features of the smartphone will include 4G VoLTE, dual-SIM support, NFC, Bluetooth 5, Wi-Fi 802.11ac, GPS and USB-Type C.